In my family, sometimes when my parents were mad at each other, they wouldn’t talk to each other. They’d be quiet in the kitchen, for example, doing their own thing, avoiding eye contact, walking around each other, and if they had to leave the house, they’d leave the house without saying ‘Good bye.’ This would sometimes happen for a few days, and it was very painful to watch people you love not love each other. In our extended family, a similar thing would happen, sometimes for years: family members wouldn’t communicate and wouldn’t go over to each other’s homes because they had an argument 100 years ago. Now it’s true that sometimes we need space from certain people, for our health and well-being; some relationships are actually dangerous to our well-being, our children’s well-being and even our soul. In some families, it’s best that certain people don’t live or work together. But in these cases, we’re separating ourselves done for the good of everyone involved, and there’s still good will between us. We’re not doing it because we’ve given up. We’re giving space so that we can love them better or legitimately protect ourselves. But what we’re talking about today is losing hope in someone and giving up on them. We avoid them, not for anyone’s good, but because we can’t stand them or we haven’t forgiven them from the heart. In the Responsorial Psalm for the vigil Mass of Christmas it reads, “Forever I will sing of your steadfast love, O Lord.” The Jewish word for ‘steadfast love’ is ‘Hesed,’ which refers to God’s covenant with His people. Whenever we read ‘steadfast love’ in the Bible, we are always supposed to make a connection with this covenant love that can’t be broken. He made a permanent agreement with them saying, “I am yours,” and “You are mine.” St. John Paul II said that ‘hesed’ “showed itself as… a love that gives, love more powerful than betrayal, grace stronger than sin” (Dives in misericordia, 52). Someone who loves you with a ‘hesed’ kind of love is “someone you can always count on, someone who never lets you down.” This is how God loves us: He never gives up on anyone, because His love for each of us is steadfast. Do you remember the story about Archbishop Sheen and William? Some stories are so beautiful they have to be told again and again. It’s a story about how God is always looking for us because of His steadfast love for us. A woman once wrote Archbishop Fulton Sheen about her brother who was in the hospital dying of cancer of the face and had been away from the sacraments for 30 years. She said her brother was an evil man because he sought to destroy goodness, faith, and morals in others. About 20 priests had gone to visit him, but he threw them all out. Knowing this, the first night Sheen visited William he stayed for only five seconds because he knew he wouldn’t do any better than the rest. But he decided to visit him for 40 nights and every night he increased his visit by 5-10 seconds. On the 40th night, he brought the Eucharist and holy oils and decided it was time to talk to him about his soul. He said, “William, you’re going to die tonight.” “I know it.” Sheen said, “I’m sure you want to make peace with God tonight.” Raising his voice, William said, “I do not. Get out!” Sheen said, “I’m not alone.” “Who’s with you?” “I brought the Good Lord along. Do you want Him to get out too?” But William said nothing. So Sheen knelt down alongside His bed for 15 minutes and promised Jesus: if William shows some sign of repentance before he dies, then he would build a chapel in the southern part of the U.S. for the poor. God’s love for William never gave up, and that love shined through Archbishop Sheen. If we had been in Sheen’s shoes, I believe most of us would not have gone back a second time. It would have seemed so useless that there’d be no point. If we had even tried five times and got rejected, then we’d give up. It wouldn’t have been worth the time and energy, right? And surely, on the tenth visit, we would have been thinking, “William is impossible. I’ve tried everything! He never changes! It’s always the same thing.” If for most of his life William had rejected us and treated us like garbage, wouldn’t we have given up? I believe many of us would have. Why? Because in little ways, we give up on people when they irritate us, when they don’t follow through, and when they hurt us again and again. But God never gives up on anyone. And that’s how we’re supposed to love each other. It says in St. John’s Gospel, “Having loved his own who were in the world, he loved them to the end” (Jn 13:1). Jesus never gives up. Every time we celebrate Mass, we emphasize this point. Jesus made a covenant with us and sealed it in His blood. When the priest prays, “THIS IS THE CHALICE OF MY BLOOD, THE BLOOD OF THE NEW AND ETERNAL COVENANT,” it means it’s the blood of His steadfast love. Steadfast love for whom? “FOR YOU AND FOR MANY.” Why? “FOR THE FORGIVENESS OF SINS.” He poured out His blood to give us another chance, even though we’re always hurting Him and letting Him down. 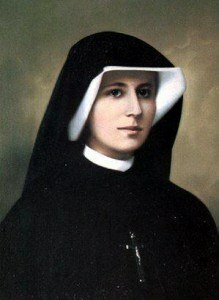 St. Faustina Kowalska, who taught so well about God’s mercy, often prayed for people who were dying, for their conversion. She said, “God’s mercy sometimes touches the sinner at the last moment in a wondrous and mysterious way. Outwardly, it seems as if everything were lost, but it is not so. The soul, illuminated by a ray of God’s powerful final grace, turns to God in the last moment with such a power of love that, in an instant, it receives from God forgiveness of sin and punishment, while outwardly it shows no sign either of repentance or of contrition” (Harvey D. Egan, An Anthology of Christian Mysticism, 573). Of course, she says, at the moment of death, some people still consciously reject this grace, which is beyond tragic, but the point is: God never gives up on people and there’s always hope, right up to the last moment of death. This is inspiring for me, in all my relationships. Because I’m human and my love is poor, I am always tempted in some ways to give up on the people in my life, especially those closest to me. After years of a difficult relationship with someone in my family, where I hadn’t seen much light for over 20 years, and our relationship had slowly gotten more and more distant, our conversations shorter, colder, more factual and with less interest, I had the best conversation with this person in years, we had a breakthrough. We were talking one night, and I saw weaknesses and faults in myself that I had never seen before; I never knew I had certain resistances to him; if you had asked me before I would have honestly said I hadn’t done anything wrong, because that’s all I knew. But then I saw, in a moment of self-revelation, my own resistance, that I had been a part of the problem of the relationship. And then he also showed his own insight, admitting that he didn’t like the way he was acting and that he did recognize his own faults. It was the best conversation of our life. I had given up hope. But God hadn’t. I’ve seen friendships that were cold for a few years be healed and renewed. I’ve seen breakthroughs where people who seem so obviously mean, irritating, and arrogant show their vulnerability and what they’re feeling. I’m not going to tell you this is easy. It’s hard. This kind of love hurts because we have to give people chances again and again. And they’re going to hurt us again, you know that, right? But, even though we get hurt again, it’s worth it. I’ll bear the suffering for two reasons: 1) to have a healed relationship with someone you love is priceless; 2) this is what real love is. Love that lasts only when things are good is not real love. Giving up on people is always the easy way out. But love that is real is always steadfast. That’s why St. Paul says love “hopes all things” (1 Cor 13:7). I’m really happy that my parents never completely gave up on their marriage. It was bad, it was very bad. They were even apart for about three years, which was good for them, to have space to breathe. But they stuck it out, and God healed so much. And I’m really happy that God has never given up on us. Considering all the stupid things we do, the people we hurt, the fact that we constantly let Him down, it’s a miracle that He still loves us. Well, that’s how God loves: His love is steadfast. 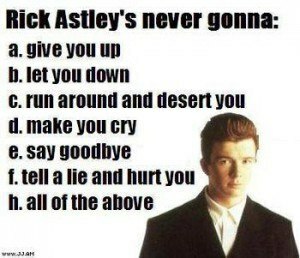 He never gives up on anyone.